When full grown, at 4 years old, males weigh 85 to 155 lbs. Females weigh 75 to 130 lbs and height will be 26 to 31 inches tall at the shoulder. Eye color (varies from Amber to Gold) and Coat color (a variety of many colors & shades) are not permanent until about 1 yr. old or later. 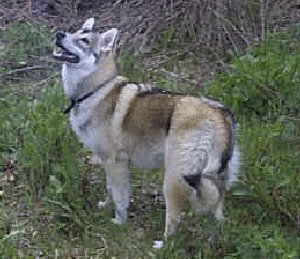 Generally wolf dogs are easy to house break, anywhere from 2 days to 2 weeks from the reports we get back. Our puppy packets include a training sheet on how to teach them not to chew on anything that doesn’t belong to them, which we have had excellent success for the last 25 years. 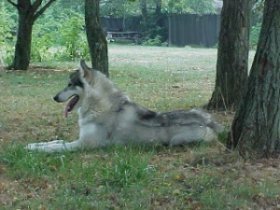 A wolf’s brain is larger than a dog’s, which gives you more to work with !! HOWEVER, because of the added intelligence they can be very mischievous! We have had reports back of these guys turning the TV on and off, changing the channels to what THEY want to watch (which is usually the National Geographic channel), opening doors. And of course finding where you hide their treats and getting them out – is kids play. One of our females will sit in the driver seat of the car when you get out, and if she thinks you’ve been in the store too long or that you’ve stood there and talked to that person long enough, she will start blowing the car horn! They are very intuitive and I swear can read your mind. They have proved this on several occasions, and I think that’s what we love so much about them. You can achieve a deeper level of communication and bonding with them that just isn’t possible with a normal dog. THEY TRULY DO BECOME YOUR BEST FRIEND. If you cannot come here to pick up your puppy we will gladly fly him or her to you, the cost of the flight is generally 265.00. There is a $60.00 deposit required on the flight kennel (which is fully refunded if you send the kennel back within 2 weeks). You can send the kennel back by UPS or the post office. The only other charge is a $25.00 fee for the health certificate (which is required by the airlines). Contact us for more information about our stud service. 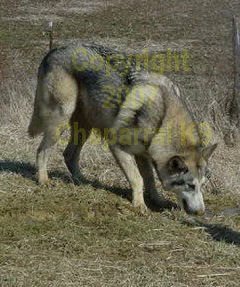 Here at Chaparral Farm, we use only AKC German Shepherds and Registered Wolf Dogs that are good with kids, loyal, intelligent, stable, trustworthy, and healthy. One of our foundation breeding females. 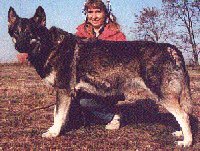 She was Timber Wolf / German Shepherd & 165 lbs. We also have white german shepherd pups available.